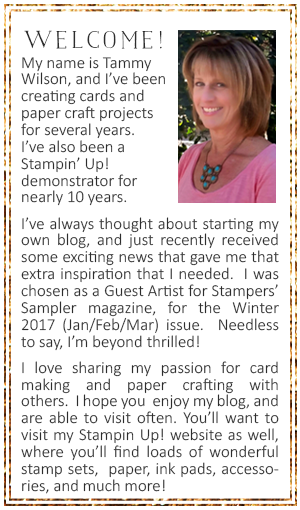 To get started, I used my Crumb Cake Classic Stampin’ Pad on a Crumb Cake card base, I used a floral stamp (from the Awesomely Artistic stamp set) for the background pattern. I added some speckling with Crumb Cake ink, and then layered on a strip of Tutti-Frutti Designer Series Paper. Since it’s one of my favorite stamp sets (um….ok, I have more than a few sets that hold that title! ), I decided to use the whimsical little birdie from A Good Day as the focal point for my card. I used my Basic Gray Archival Stampin’ Pad, and “stamped off” one time before stamping each bird on Whisper White Cardstock. To color these little cutie pies, I used my Aqua Painter along with my Blushing Bride and Flirty Flamingo Classic Stampin’ Pads. For the speckling, I used Sahara Sand ink. Once the ink was dry, I crinkled the paper to add some dimension, stapled a little bit of Lemon Lime Twist Ombre Ribbon on the end, and then popped it up with Stampin’ Dimensionals. To create the mini scalloped, I used the Decorative Ribbon Border Punch along with a little strip of Tutti-Frutti Designer Series Paper. I heat-embossed the sentiment (using a Versamark Pad and White Stampin’ Emboss Powder) on Basic Black Cardstock, and added a few Mini Stampin’ Dimensionals to pop it up. For a bit of sparkle and shine, I added a few Metallic Sequins. TIP: To create a fun pattern or border on your project, stamp one image multiple times. As you are watercoloring each image, “highlight” one of the images by adding extra layers of color to make that one image stand out from the crowd.